HON didn’t become the most recognized name in office furniture overnight. Since 1944 our products have helped doers like you achieve more workday victories. The bold idea successfully sold to the tough manager happens in our chairs. The click of our file cabinet drawer signals another project well done. Cleaning off the top of our table, just to get it dirty again. Whether the pressure is on, or the rest of the office is gone, we’re right there with you. To help you work smarter, more comfortably and on your terms. What happens when support and affordability come together? Convergence. 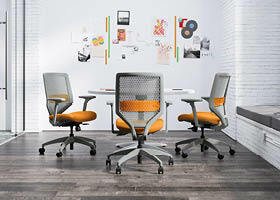 This is the task chair that is as attainable as is it comfortable, with customizable features such as tilt control option, arm styles, extra lumbar support, and thick seat cushions. 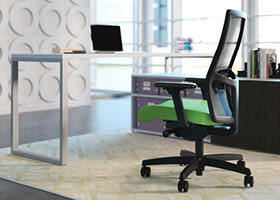 Convergence puts all the features you’re looking for into one low-priced task chair. With three back materials, three ergonomic controls and an optional adjustable lumbar support, Solve answers the need for total customization. Optimal balance. Proper alignment. Total support. It helps everyone do more with less, making it the one chair to fit every space. Ignition is flexible enough to handle any day-to-day tasks, as well as support any future needs. Designed by Wolfgang Deisig to be a combination of human centered design and full family selection, Ignition has everything you need to outfit your entire space and give everyone the comfort and performance they need.